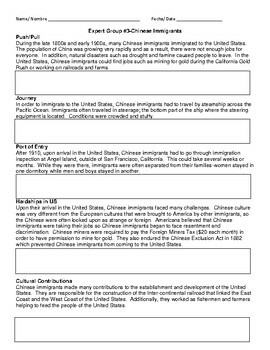 Looking for an interactive way for students to learn about different immigrant groups and their contributions to the United States? This product is for you! This product highlights 4 major groups of immigrants to the US during the late 1800s and early 1900s. Immigrants from Ireland, Italy, China and Japan are represented. 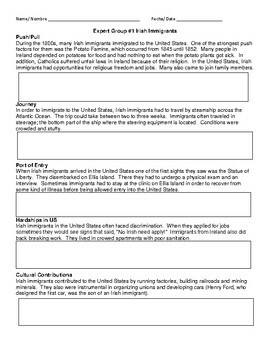 Students become experts of one immigrant group (the push/pull factors, journey, port of entry, challenges they faced in the United States and the contributions they made to our country) and then share their knowledge with other students. This product comes with versions of the activity in BOTH English and Spanish along with detailed directions for use and a sample. 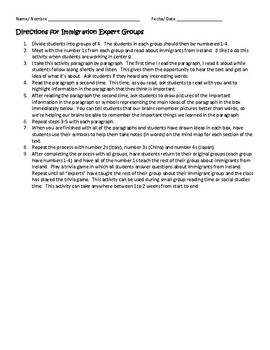 This activity takes a good 2 weeks and can be done as the "work with teacher" station for reading or social studies centers.